Wakeboard is so addictive! As the world’s fastest growing tow sport, it created its own lifestyle. 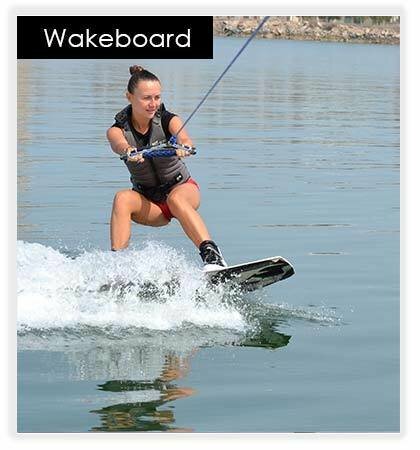 But you don’t have to be able to hit a sick scarecrow or throw down a tantrum to enjoy wakeboarding. It’s a sport that provides a sense of achievement and thrills even for complete novices. At Adventure Water sports our qualified, certified and experienced coaches will have you on your feet in no time, and their patient instruction ensures your fast progress to being ‘dope on a rope’. Intermediate rides benefit from the quality of our equipment, boat and coaching, progressing their riding skills and learning new tricks each and every session. Specific programs can be worked out to ensure your development is measurable, and the satisfaction of nailing your goals and landing your tricks lasts long after you’re back on the dock. With a tournament level boat and wonderful conditions, advanced and expert riders will adore the relaxed atmosphere we generate, allowing you to concentrate on enjoying what you do best.